The indigenous people of Southern Africa, whose territory spans most areas of South Africa, Zimbabwe, Lesotho, Mozambique, Swaziland, Botswana, Namibia, and Angola, are variously referred to as Bushmen, San, Sho, Barwa, Kung, or Khwe. These people were traditionally hunter-gatherers, part of the Khoisan group and are related to the traditionally pastoral Khoikhoi. Starting in the 1950s, and lasting through the 1990s, they switched to farming as a result of government-mandated modernization programs as well as the increased risks of a hunting and gathering lifestyle in the face of technological development. There is a significant linguistic difference between the northern Bushmen living between Okavango (Botswana) and Etosha (Namibia), extending into southern Angola on the one hand and the southern group in the central Kalahari towards the Molopo, who are the last remnant of the extensive autochthonous San of South Africa. The Bushmen have provided a wealth of information for the fields of anthropology and genetics, even as their lifestyles change. One broad study of African genetic diversity completed in 2009 found the San people were among the five populations with the highest measured levels of genetic diversity among the 121 distinct African populations sampled. The San are one of 14 known extant “ancestral population clusters” (from which all known modern humans evolved). The terms San, Khwe, Sho, Bushmen and Basarwa have all been used to refer to the hunter-gatherer peoples of southern Africa. Each of these terms has a problematic history, as they have been used by outsiders to refer to them, often with pejorative connotations. The individual groups identify by names such as Ju/’hoansi and !Kung (the punctuation characters representing different click consonants), and most call themselves by the term Bushmen when referring to themselves collectively. The different San language groups of Namibia met in late 1996 and agreed to allow the general term San to designate them externally. This term was historically applied by their ethnic relatives and historic rivals, the Khoikhoi. This term means outsider in the Nama language, and was derogatory because it distinguished the Bushmen from what the Khoikhoi called themselves, namely, the First People.Western anthropologists adopted San extensively in the 1970s, where it remains preferred in academic circles. The term Bushmen is widely used, but opinions vary on whether it is appropriate because it is sometimes viewed as pejorative. In South Africa, the term San has become favored in official contexts, and is included in the blazon of the new national coat-of-arms; Bushman is considered derogatory by many South Africans, regardless of their race. Angola does not have an official term for the San, but they are sometimes referred to as Bushmen, Kwankhala, or Bosquímanos (the Portuguese term for Bushmen). In Lesotho they’re referred to as Baroa, which is where the Sesotho name for south, Boroa, comes from. Neither Zambia nor Zimbabwe have official terms, although in the latter case the terms Amasili and Batwa are sometimes used.In Botswana, the officially used term is Basarwa, where it is partially acceptable to some Bushmen groups, although Basarwa, a Tswana label derived from Twa, also has negative connotations. The term is a class 2 noun (as indicated by the “ba-” class marker), while an older class 6 variant, Masarwa, is now almost universally considered offensive. 1000- to 2000-year-old San paintings near Murewa, Zimbabwe. Since the mid 1990s, the central government of Botswana has implemented a relocation policy, aiming to move the Bushmen out of their ancestral land on the Central Kalahari Game Reserve into newly created settlements. Although the government has categorically denied that relocation has been forced, a recent court ruling confirmed that the removal was unconstitutional and residents were forcibly removed. Opponents to the relocation policy claim that the government’s intent is to clear the area — an area the size of Denmark — for the lucrative tourist trade and diamond mining. This is strenuously denied on the government’s official web site, stating that although exploration had taken place, it concluded that mining activity would not be viable and that the issue was not related to the relocation policy. It is further claimed that the group as a whole has little voice in the national political process and is not one of the tribal groups recognized in the constitution of Botswana. Over the generations, the Bushmen of Southern Africa have continued to be absorbed into the African population, particularly the Griqua sub-group, which is an Afrikaans-speaking people of predominantly Khoisan that has certain unique cultural markers which set them apart from other Africans. 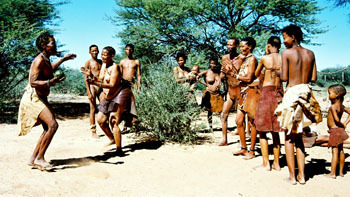 On December 13, 2006, the Bushmen won a historic ruling in their long-running court case against the government. By a 2–1 majority, the court ruled the refusal to allow the Basarwa into the Central Kalahari Game Reserve (CKGR) without a permit, and the refusal to issue special game licenses to allow the Bushmen to hunt, was “unlawful and unconstitutional”. It also found that the Bushmen were “forcibly and wrongly deprived of their possessions” by the government. However, the court did not compel the government to provide services such as water to any Bushmen who returned to the reserve. As of 2006, more than 1,000 Bushmen intended to return to the Central Kalahari Game Reserve, one of Africa’s largest protected nature reserves.However, only limited numbers of Bushmen have been allowed to return to this land. In April 2008, the United Nations Human Rights Council (UNHRC) criticised Botswana’s government for not allowing certain Bushmen to return. Hoodia gordonii, used by the San Bushmen, was patented by the South African Council for Scientific and Industrial Research (CSIR) in 1998, for its appetite suppressing quality. A license was granted to Phytopharm, for development of the active ingredient in the Hoodia plant, p57 (glycoside), to be used as a pharmaceutical drug for dieting. Once this patent was brought to the attention of the San, a benefit-sharing agreement was reached between them and the CSIR in 2003. This would award royalties to the San for the benefits of their indigenous knowledge. The San were represented by a regional organisation formed under San leadership, the Working group of Indigenous Minorities in Southern Africa (WIMSA). This benefit-sharing agreement is one of the first to give royalties to the holders of traditional knowledge used for drug sales. The terms of the agreement are contentious, because of their apparent lack of adherence to the Bonn Guidelines on Access to Genetic Resources and Benefit Sharing, as outlined in the Convention on Biological Diversity (CBD). The San have yet to profit from this agreement, as P57 has still not yet been legally developed and marketed. The Bushman kinship system reflects their interdependence as traditionally small mobile foraging bands. The kinship system is also comparable to the eskimo kinship system, with the same set of terms as in Western countries, but also employing a name rule and an age rule. The age rule resolves any confusion arising from kinship terms, as the older of two people always decides what to call the younger. Relatively few names circulate (approximately only 35 names per gender), and each child is named after a grandparent or another relative. Children have no social duties besides playing, and leisure is very important to Bushmen of all ages. Large amounts of time are spent in conversation, joking, music, and sacred dances. Women have a high status in the San society, are greatly respected, and may be leaders of their own family groups. They make important family and group decisions and claim ownership of water holes and foraging areas. Women are mainly involved in the gathering of food, but may also take part in hunting. The most important thing in the lives of the San people is water. Droughts can last for many months and waterholes may dry up. When this happens, they use sip wells. To get water this way, a San will scrape a deep hole where the sand is damp. Into this hole will be put a long hollow grass stem. An empty ostrich egg is used to collect the water. Water is sucked into the straw from the sand, into the mouth, and then travels down another straw into the ostrich egg. Traditionally, the San were an egalitarian society. Although they did have hereditary chiefs, the chiefs’ authority was limited. The bushmen instead made decisions among themselves by consensus, with women treated as relatively equal. In addition, the San economy was a gift economy, based on giving each other gifts on a regular basis rather than on trading or purchasing goods and services. Villages range in sturdiness from nightly rain shelters in the warm spring (when people move constantly in search of budding greens), to formalized rings, wherein people congregate in the dry season around permanent waterholes. Early spring is the hardest season: a hot dry period following the cool, dry winter. Most plants are still dead or dormant, and supplies of autumn nuts are exhausted. Meat is particularly important in the dry months when wildlife can’t range far from the receding waters. Bushmen women gather fruit, berries, tubers, bush onions, and other plant materials for the band’s consumption. The eggs of ostriches are gathered, and the empty shells are used as water containers. In addition to plants, insects furnish perhaps ten percent of animal proteins consumed, most often during the dry season.Depending on location, the Bushmen consume 18 to 104 species including grasshoppers, beetles, caterpillars, moths, butterflies, and termites. The women’s traditional gathering gear is simple and effective: a hide sling, a blanket, a cloak called a kaross to carry foodstuffs, firewood, smaller bags, a digging stick, and perhaps a smaller version of the kaross to carry a baby. Bushmen men traditionally hunted using poison arrows and spears in laborious, long excursions. Kudu, antelope, deer, dikdik, and buffalo were important game animals. The Bushmen offered thanks to the animal’s spirit after it had been killed. The liver was eaten only by men and hunters, because it was thought to contain a poison unsafe for women. In the 1990s, a portion of the population switched to livestock farming as a result of government-mandated modernization programs, as well as the increased risks of a hunting and gathering lifestyle in the face of technological development. 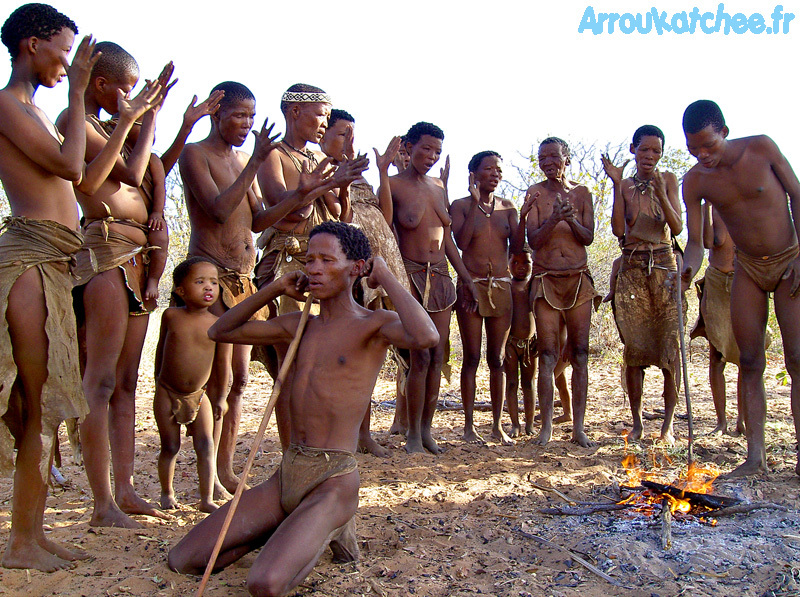 Historical evidence shows that certain Bushmen communities have always lived in the desert regions of the Kalahari. But nearly all of the Bushmen communities in southern Africa were eventually forced into this region. The Kalahari Bushmen remained in poverty where their richer neighbours denied them rights to the land. Before long, in both Botswana and Namibia, they found their territory drastically reduced. The Bushmen of the Kalahari were first brought to the Western world’s attention in the 1950s by South African author Laurens van der Post. In 1955, Van der Post was commissioned by the BBC to go the Kalahari desert with a film crew in search of the Bushmen. The filmed material was turned into a very popular six-part television documentary a year later. Driven by a lifelong fascination with this “vanished tribe”, Van der Post published a 1958 book about the same expedition, entitled The Lost World of the Kalahari. It was to be his most famous book. In 1961 he published The Heart of the Hunter, a narrative derived from 19th-century Bushmen stories by Wilhelm Bleek. Van der Post’s work is largely discredited, as it is the subjective view of a European in the 1950s and 60s. His opinions branded the San as simple “children of Nature” or even “mystical ecologists”. In the 1970s, South African writers such as R.O. Pearse stated that the Bushmen were somewhere between animals and mankind. John Marshall, the son of Harvard anthropologist Lorna Marshall, documented the lives of Bushmen in the Nyae Nyae region of Namibia over a more than fifty year period. His early film The Hunters, released in 1957, shows a giraffe hunt during the 1950s. N!ai, the Story of a !Kung Woman (1980) is the account of a woman who grew up while the Bushmen were living as autonomous hunter-gatherers, but who was later forced into a dependent life in the government-created community at Tsumkwe. A Kalahari Family (2002) is a five-part, six-hour series documenting fifty years in the lives of the JuǀʼHoansi of Southern Africa, from 1951 to 2000. Marshall was a vocal proponent of the Bushman cause throughout his life. The BBC series How Art Made the World compares San cave paintings from 200 years ago to Paleolithic European paintings which are 14,000 years old. Because of their similarities, the San works may illustrate the reasons for ancient cave paintings. In this programme, Nigel Spivey draws largely on the work of Professor David Lewis-Williams. Drawing parallels between modern hunter-gatherers in southern Africa (Bushmen) and the Americas, Lewis-Williams shows that healers, or ritual specialists, deliberately force themselves into a trance in which they travel to the spirit world. The visions they experience on these journeys of the mind are terrifying and complex, and the activity itself is undertaken for the good of the community. The Kalahari Bushmen go to the spirit world to entreat with their god for the lives of the sick, to make rain, and to control the movements of the game animals. In the lightest stages of trance states, all humans have the capacity to see geometric shapes known as form constants. They are hard-wired in the brain. As the trance deepens, and the subject tries to make sense of the shapes, so they change into things which are governed by that person’s particular culture. The geometries are found all over the world and throughout history. Coupled to this are experiences such as changing into animals: the rock art traditions of hunter-gatherers the world over — including Ice Age Europe — contain images of figures which are half human and half animal . Going into deep caves is likened to going into a deep trance. Some images in France and Spain are over 1 km into the caves. Native Americans would call this ‘Vision Questing’ — going to barely accessible places such as mountain tops to perform rock art making, the images likely derived from visions they had experienced at special ceremonies. Spencer Wells‘ 2003 book The Journey of Man — in connection with National Geographic‘s Genographic Project — discusses a genetic analysis of the San and asserts their blood contains some of the oldest genetic markers found on Earth. The Bushmen’s Y-chromosomal DNA haplogroup (type A) is one of the oldest, splitting off around 70,000 years ago from those found in the rest of humanity (type BT). Therefore, the Bushmen likely represent one of the oldest existing populations. Genetic markers present on the y chromosome are passed down through thousands of generations in a relatively pure form. The PBS documentary based on the book follows these markers throughout the world, demonstrating that all of humankind can be traced back to the African continent and that the San are one of the oldest, most genetically unadulterated, remnants of humankind’s ancient ancestors. More recent analysis suggests that the San may have been isolated from other original ancestral groups for as much as 100,000 years and then rejoined at a later date, re-integrating the human gene pool. This entry was posted on March 14, 2012 at 12:20 pm and is filed under THE UNIVERSE & SPACE SCIENCE. You can follow any responses to this entry through the RSS 2.0 feed. You can leave a response, or trackback from your own site.